A new gallery space gives a historic collection a fresh look. 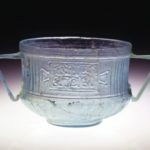 Ennion Cup, Sidon, Lebanon, Roman Empire, circa 40-50 C.E., Roman mold-blown glass. Foundation Brick, Qantir, Egypt, reign of Ramesses II, 19th Dynasty (1299-1240 B.C.E. ), faience. Mirror, Egypt, Middle Kingdom, Dynasty 13 (1783-1715 B.C.E. ), bronze and wood. 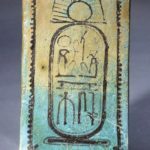 On December 8, The Newark Museum in Newark, N.J., opened “Art of The Ancient Mediterranean: Egypt, Greece and Rome,” its relocated and reinstalled ancient-art gallery. The move was prompted by the renovation of the museum’s front entrance, which had been closed to the public for 20 years before reopening last month. A portion of the viewing space that housed the Ancient Mediterranean collection for 28 years is now allocated for the new ADA-accessible entrance lobby, and the ancient Egyptian, Greek, and Roman works have found a home in the museum’s South Gallery. The collection’s new real estate is about as prime as it gets, positioning the works as the starting point of the museum’s permanent galleries and a springboard for the understand of Western art history. What’s more, the Ancient Mediterranean collection is now parallel to the Arts of Global Africa Permanent Collection, which has relocated to the museum’s first floor. The proximity of the two collections helps acknowledge a point that is often disregarded by museums and the art-historical canon: that the art of ancient Egypt is just as important to the history of African Art as it is to that of the ancient Mediterranean. The museum’s classical collection is an integral part of its early history. Mrs. Samuel Clark gave the institution a large group of objects representing everyday life in the ancient world in 1924. Shortly thereafter, Louis Bamberger, the Newark department store magnate and the benefactor of the museum’s Jarvis Hunt-designed building (the newly refurbished front entrance will be renamed “the Bamberger Entrance” in his honor) began buying Cypriot pieces that were being de-accessioned from the Metropolitan Museum of Art’s Cesnola Collection. 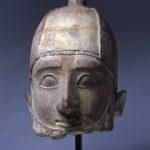 In fact, his first purchase, a votive head from Cyrpus, circa 700–680 BCE, which he gifted to the museum in 1928, is a highlight of the new gallery. In 1950, the Newark Museum received a colossal gift from Eugene Schaefer, a chemist and collector from Bergen County, N.J., of some 2,000 objects, two-thirds of which are glass. As a result, Newark has one of the most important ancient glass collections in the country; it showcases the history of glass and glassmaking technology from Egypt, Greece, Rome and the Islamic world from 1500 BCE through 1400 CE. One standout of the Schaefer glass collection is the mold-blown glass Ennion Cup (circa 40–50 CE), from Sidon, Lebanon, under the Roman Empire. It represents a major achievement in glass-making, when artisans working within the area of Jerusalem at the end of the 1st century BCE realized that glass could be inflated at the end of a tube—thus discovering glass blowing. Ennion, perhaps the most proficient of all glassmakers in the art of self-branding, incorporated his name into the designs of his cups and vessels, making him one of the few Roman glassmakers we know by name. The Schaefer gift catalyzed many additions to the museum’s glass collection over the course of decades. One fine example in the gallery, a Roman glass skyphos (circa 0–50 CE), was purchased in 1975. 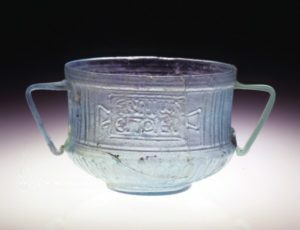 Here in deep blue glass, the skyphos shape was developed by the Greeks in the Geometric Period as a two-handled wine cup, often, as with this example, on a low flanged base. A related shape, the kylix—a shallower two-handled cup with a longer stem (like a champagne coupe with training wheels)—can be seen in the gallery in the Greek black-figure pottery style. The Kylix Drinking Cup with Horseman, made in Athens circa 525 BCE, features a rider on horseback on its exterior, with Greek lettering. Speaking of lettering, the hieroglyphic detail on another standout, the Coffin Lid of Henet-Mer, is astoundingly bold and detailed. 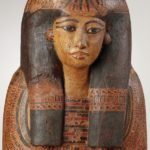 Made in Thebes, Egypt during the 21st Dynasty (1075–945 BCE) of sycamore fig wood, gesso, and paint, the lid reveals that Henet-Mer (“Mistress of Love”) was married, a singer, and a priestess of Amon-Ra, the Egyptian sun god. 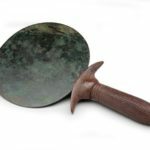 An item more suited for the lives of the living, an Egyptian mirror, can also be found in the gallery. 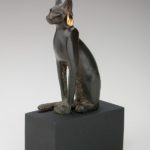 From the Middle Kingdom, 13th Dynasty (1783–1715 BCE), the piece is wrought of bronze and gracefully carved wood. A pair of ivory clappers from the 12th Dynasty (1981–1802 BCE) are also on view. This curious set of objects, carved in the shape of human hands and arms up to the elbows, at first resembles an elegant alternative to the inflatable, percussive sticks we often use at sports games. Instead, the clappers were proper percussion instruments beaten to keep time during dances or musical performances.